It might not have been Clarke Johnstone and Balmoral Sensation’s best dressage test at the Land Rover Horse of the Year CIC3* in Hastings today, but it was good enough to hold the overnight lead going into Saturday’s cross-country. Their score of 31.7 penalties gives them a narrow margin over Amanda Pottinger on Just Kidding and Sarah Young on Leo Degas, who scored 33.6 and 33.7 penalties respectively. Madison Crowe is close behind on Waitangi Pinterest with 34 penalties, while Clarke is fifth on Kate Wood’s Wolf Whistle II with 35.3 penalties. Nick Brooks was delighted with the inexperienced For Fame who earned 35.7 penalties to be sixth, showing a lot of promise for the future. The Ground Jury of Helen Christie (NZL), Christian Landolt (SUI), and Annabel Scrimgeour (GBR) were unanimous in having Balmoral Sensation on top, but were challenged by the range of ability displayed by the field of 23 starters. They ranged in experience from first season 3* horses to the experienced ‘Ritchie’, winner of the Adelaide CCI4* last November and sixth at the Rio Olympics in 2016. Chris Ross’s cross-country course asks some new questions, but time will be of the essence as it winds around the Hawkes Bay Showgrounds and through the trade stand and hospitality areas. The going should be good following heavy rain prior to the start of the show, but it has to be said that the surface for the dressage was less than ideal following three days of showjumping in the arena. 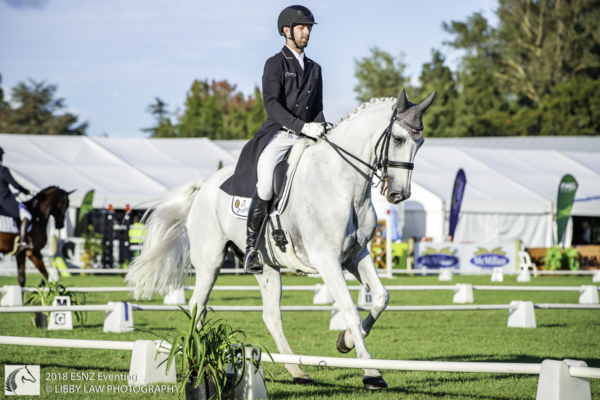 The 24 strong CIC2* class, judged by Anne Tylee and Jenny Draper, produced some quality performances, and is tightly contested at the top, so there are a number of exciting combinations coming through the grades.